← “The Daughters and Spirit of Harriet” is Now Live! My second co-authored book launches on Tuesday, October 29th, and here’s a quick summary: Depression can cripple us; miracles will save us! Brave, courageous women are stepping out to create a ripple effect! 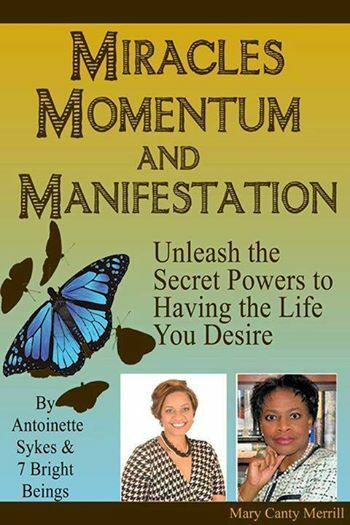 In “Momentum, Miracles and Manifestation,” they are determined to show a different pathway for a world where, quite frankly, life happens… their message is: YOU can happen to life! In an empowering anthology, co-authors share their super successful Miracles, Momentum and Manifestation concepts… as dynamic and transformational experts – all leading to a better place in what we call an intentional LIFE! The stories here fill their mission and message, which is paramount to other women, leaders, professionals and other entrepreneurs during this time. Advance Praise: ~ TR Stearns — This empowering writer shares with you exactly what miracles, momentum and manifestation mean to her… those improbable events that defy the laws of science and nature, which surpass all human logic because they occur through Divine intervention. She in a beautiful example of gaining momentum in a life challenge… the strength and forward movement that compels and propels her to higher ground. There is no doubt of her manifesting a life shift… showing physical evidence of the seeds she planted and the things she desired for her life. Vulnerability and transparency are evident throughout her story; it is a public display of Merrill’s testimony – a signaling that she arrived in a new and different place. I deeply appreciate your continuous support, and please share with those individuals whom you believe could use a miracle in their lives.